As anyone who knows me can attest, I love to ride and am always looking for ways to combine adventures. However, with the 2009 BMW Adventure (Sally) it seems that trips frequently end up on the highway, buzzing along at 70+ mph – very focused on the destination rather than the journey. The Ural would force a bit of change here. Damn thing hardly goes 70 mph – and is not happy doing so. Much more comfortable at 50 mph or less on country roads. 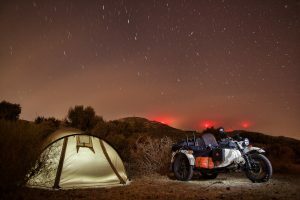 Wild camping near Algeciras, Spain. Whatever the motivation, just seems like good old-fashioned fun and an opportunity to meet folks interested in the machine. It certainly draws attention. Honestly, it is hard to justify for other than something fun; without any real financial or other practical basis. So, here’s my plan. Buy a Ural with the intention of riding around Maine over the next year and visiting every brewery I can find – at last count I think there were 112 of them…. 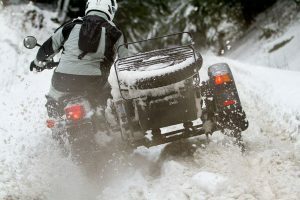 Or, maybe use the Ural as a “vehicle” to experience the state and write about those experiences? Hmmm… not sure either would fly – but would be great to try. 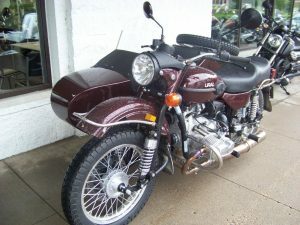 Found a demo bike out in Minnesota – probably $15,000 to get it – not including flying out there and driving back. Looks a little too pretty for my intended use, but should do the trick. Now, the next step is convincing the responsible one in our family that there is a good reason to have a 2nd bike as I am sure the 1st question will be “Why do you need a 2nd motorcycle?” – How do I answer that one? 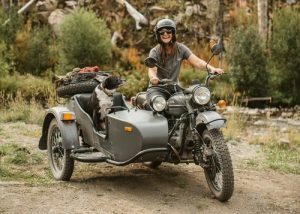 This entry was posted in Motorcycling and tagged Maine, sidecar, Ural on July 1, 2017 by Ted.